I spoke to a number of investors about my market views that the current weakness is a dip to be bought on Friday and got back a number of comments to the effect of "what about the risks?" I therefore want to expand on my thoughts on the broader big picture issues. 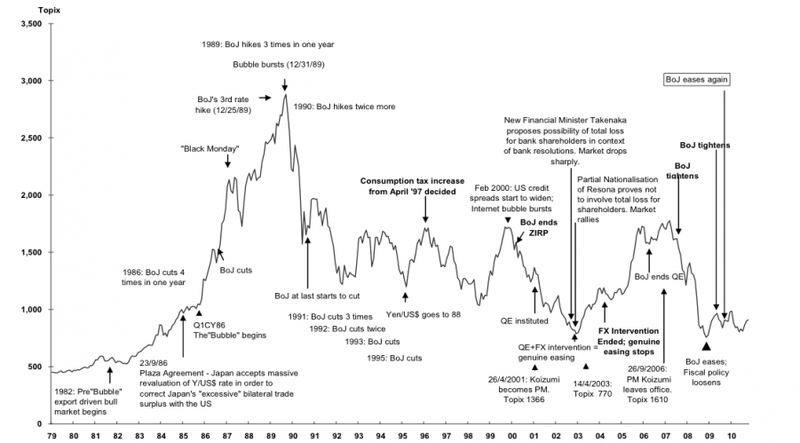 The global economy had an enormous accident in 2008 and thereafter. The monetary and fiscal authorities managed to patch things up, though not necessarily in the right way. The level of risk has therefore risen considerably. We are now running on our spare tires and another growth pothole (Chinese slowdown, European sovereign debt crisis, US municipal bond implosion, etc.) could send us back into another global recession and imperil the health of the banking system. Given the weakened state of the global economy, we are likely to see a series of stimulus-tightening boom-bust cycles, much like the Japanese experience of the last two decades. The market was weak last week over the Libyan unrest spreading to the rest of the Middle East. Minor supply disruptions like that can scare the markets but they resolve themselves over time. Any possible new regime will need the oil revenues and turn the taps back on. What I was more concerned about were the broader macro risks, such as the results of the Irish election and risks posed to the European banking system. In the intermediate term, the backdrop is ominous. The current environment reminds me of late 2007 and early 2008. Then, we had a commodity blowoff, equity overvaluation and looming macro risks. Today, we have a commodity blowoff, equity overvaluation and looming macro risks. Barry Ritholz pointed out an analysis from Alain Bokobza of Société Générale indicating that forecasts have become overly optimistic and asset prices are poised for a tumble. In the short run, it appears that the Fed is determined to throw a party with QE2 by targeting asset prices. In the event that the Tunisian-Egyptian-Libyan contagion were to spread rising oil prices began to create risks to economic growth and employment, then who doesn't expect QE3. That way, short-term problems are papered over but somewhere between QE3 and QE33, the medicine stops working and then we all get into big trouble. Given this kind of volatile macro backdrop, I have opted to use an intermediate term trend following model like the Inflation-Deflation Timer Model to trade the boom and bust cycles. For now, my technical, sentiment and industry indicators are all pointed up. Nevertheless, I am terrified of the macro risks. I am relying on the risk control discipline of the Timer Model to limit losses while allowing winners to run. In other words, I am thinking bearishly but trading bullishly. Is this the Top? Or a minor pullback? Model: The Inflation-Deflation Timer Model, which is a trend following model as applied to commodity prices on the basis that commodities represent the "canaries in the coal mine" of global growth and inflationary expectations, remain bullish on the "inflation" or "risk" trade. Technical: Secondary indicators of risk aversion are still trending towards the "risk-on" trade. Industry fundamentals: Current market weakness is based largely on fears of the effects of a cutoff in Libyan oil output and how such a price shock might impact the fragile global economy. Analysis shows that the expected effect of any disruption is likely to be minor. The markets appear to be starting to discount the worst case scenario a contagion effect of the popular unrest spreading to Saudi Arabia. 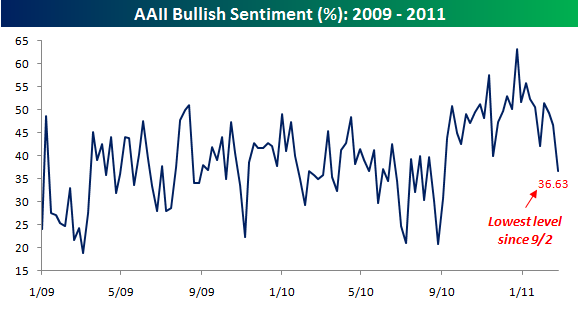 Sentiment: A surprising quick retreat in bullish sentiment in the AAII surveys after this week's market weakness is contrarian bullish. For the time being, my base case is that the current market action represents a minor correction. Should the weakness continue and violate the uptrends evident in the indicators, then my risk control discipline would then turn more defensive. The Inflation-Deflation Timer Model looks for a price trend in commodity prices, largely because commodities are considered to be a highly sensitive real-time barometer of global growth and inflationary expectations. A look at the CRB Index shows that commodities remain in an uptrend. Given the recent geopolitical turmoil in the markets, it would be expected that headline commodities such as oil and gold would be in rally mode. But the Timer Model considers all commodities, not just precious metals and energy. Last week, before the Libyan unrest news hit the tape, it was the turn of softs and agricultural commodities to rally (remember all the news about food inflation in the emerging markets)? In fact, softs such as cotton have taken it on the chin this week. Net-net, the entire commodity complex remains in a healthy uptrend. In particular, the price of Dr. Copper is staying in an uptrend. Risk aversion measures still trending to "risk"
Some of these indicators, such as the copper price and the Consumer Discretionary to Staple ratio, are testing their uptrend lines. Until we see violations of these trendlines, my inclination is the give the bulls the benefit of the doubt for now. The particular dynamic model from which the above Brookings figure came builds in quite strong nonlinearities and threshold effects. Interestingly, according to that specification, one wouldn't begin to anticipate significant effects on U.S. GDP until the price of oil got above about $130 a barrel, or until the second half of this year. Prior to that, according to that specification, we're still ok. I don't want to make too strong a claim about those particular details. It's very hard to claim precise statistical evidence in support of one choice of a threshold over another. But, this particular model has held up fairly well since its original publication in 2003. So I'm not about to abandon it just yet. Saudi Arabia's King Abdullah returned to the kingdom Wednesday after a three-month absence for medical treatment and introduced a number of nonpolitical reforms amid regional uprisings that have toppled regimes in Tunisia and Egypt and infected neighboring Bahrain. We can get an idea of the level of tension in the markets by monitoring Intrade for an assessment of the stability of the government of Saudi Arabia's neighbors. Currently, the odds that Prime Minister Khalifa Bin Salman Al Khalifa is no longer the Prime Minister of Bahrain by December 31, 2011 is about 60%. To the south, the odds that Ali Abdullah Saleh is no longer the President of Yemen by December 31, 2011 is about 65%. The markets appear to be focusing on the nightmare scenario based on the threat of political turmoil to Saudi Arabia's neighbors. When markets start to discount the worst, it is time to buy. However, given the level of these Intrade odds, the risk premium may continue to rise and there may be further downside to this correction. Is the retail investor capitulating already? The final bullish underpinnings to this market is the recent reading out AAII showing that bullish sentiment fell from 46.6% to 36.6% in a single week. Given that the survey was done on Tuesday and there has been further weakness since then, it is likely that bullish sentiment has deteriorated further. Such levels of panic in the face of minor weakness is generally viewed as contrarian bullish. The Turing Test is a test of a machine's ability to demonstrate intelligence . A human judge engages in a natural language conversation with one human and one machine, each of which tries to appear human. All participants are separated from one another. If the judge cannot reliably tell the machine from the human, the machine is said to have passed the test. This was a great day in the field of artificial intelligence and the lessons learned have huge potential for medical and other commercial applications. But does that mean that the machines are destined to take over? This is a topic that is near and dear to my heart as what is being proposed is a more generalized application of quantitative analysis for investing. As I have written about in an earlier post, you have to be intelligent in how you apply quantitative techniques to investing. You can't allow your systems to go fully on autopilot but apply your own market knowledge, experience and intuition to the process. Computers are idiot savants. They will do exactly what you tell them to do and no more. The responsibility of the human designer is to understand the programs blind spots and override the program under the right circumstances. Others quants, such as Paul Wilmott, have hammered on this point over and over again. For instance, consider this example from Bronte Capital, which points out that the reported numbers on a Chinese company doesn't seem to add up. Would standard multi-factor stock selection models pick up on such a discrepance? Not likely. Don't get me wrong. I believe that Watson's triumph represents a leap forward and Watson's metaphorical children will undoubtedly be highly productive. Nevertheless, we need be careful about the street smarts of the programmers of Watson's children. The following headline came across my desk: Obama to offer infrastructure financing for Brazil. The brief story went on to say that the initiative is intended to help US/Brazilian joint ventures to prepare for the 2014 World Cup and 2016 Olympics. For Brazilians, prices in the once moribund residential and office real estate market are rising so fast that areas are rapidly becoming unaffordable. There are signs that the market is becoming frothy as people invest with the intention of flipping properties in the next couple of years. Flipping? Isn't that just bubblelicious? Can the bears follow through? The events in Libya and Bahrain have spark a selloff and a risk-off stampede in the last couple of days. While there has been some minor technical damage done, I hesitate to call this an intermediate term top unless I can see further signs of technical deterioration. For example, the SPX remains in an uptrend that began in September and it is now testing a minor support level. Cyclically sensitive commodity prices are still on a tear. While the softs, which had been showing huge strength of late, got clobbered, gold and energy rose and the CRB Index staged an upside breakout and rallied to another high. Some of the other indicators of cyclical leadership that I talked about here are still flashing bullish. 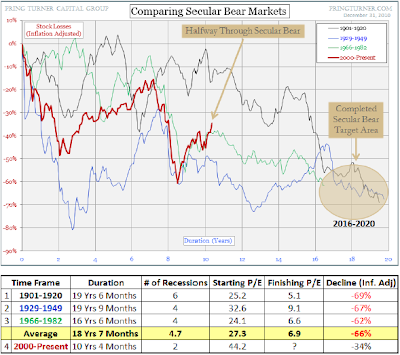 As an example, the cyclically sensitive semiconductors remain in a relative uptrend against the Technology sector indicating that the cyclical risk-on trend is staying intact. The tone of much of the commentary I heard late Tuesday showed that a high degree of nervousness. 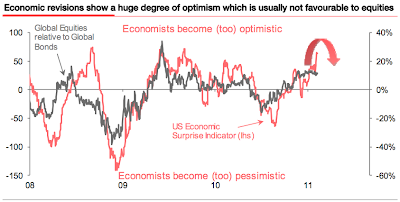 As well, Scott Grannis points out that the US economy is benefiting from some fundamental tailwinds, which could be sources of positive surprises during the 4Q and 1Q Earnings Seasons. Given the level of skepticism in the rally, evidence of improving fundamentals and continuing evidence of a bullish intermediate trend, I would be inclined to lean bullish until we see evidence that the bears can significantly follow-through on the last couple days of market weakness. Can the rich get too rich? 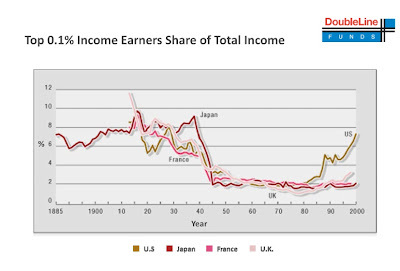 Patrick Chevanec recently posted about a blind spot in how China is dealing with income inequality. He quoted an anonymous author who is an economist at a Chinese university warning that resentment is rising, not because of income inequality, but the lack of opportunity. There seems to be a general perception that there is one set of rules for the privileged and another for everyone else. Chevanec went on to state his opinion that the way that the Chinese government is dealing with the issue is all wrong. They are relying on local officials to police the problem when the local officals ARE the problem (i.e. privilege). Anyone familiar with China’s chengguan (municipal police, who often serve as bully-boys and bribe-collectors for local officials) knows that nearly identical incidents – sometimes, but not always, minus the gruesome ending — take place on a daily basis all across China (the above link to a 2009 TIME magazine article by Austin Ramzy is well worth reading, and comparing to the Tunisian incident). The main point of the the article in The Diplomat is that China’s leaders, along with many commentators, are misdiagnosing the source of people’s resentment over inequality — and that giving party bureaucrats a more active role in managing the economy will make the problem worse, not better. This isn't a surprise because that's what happens in class based societies! Throughout most of Asia, societies are based on social stratifications. This sort of bullying happens (i.e. beatings, etc.) when you don't care about what happens to the lower classes and you don't think that their opinion matters. 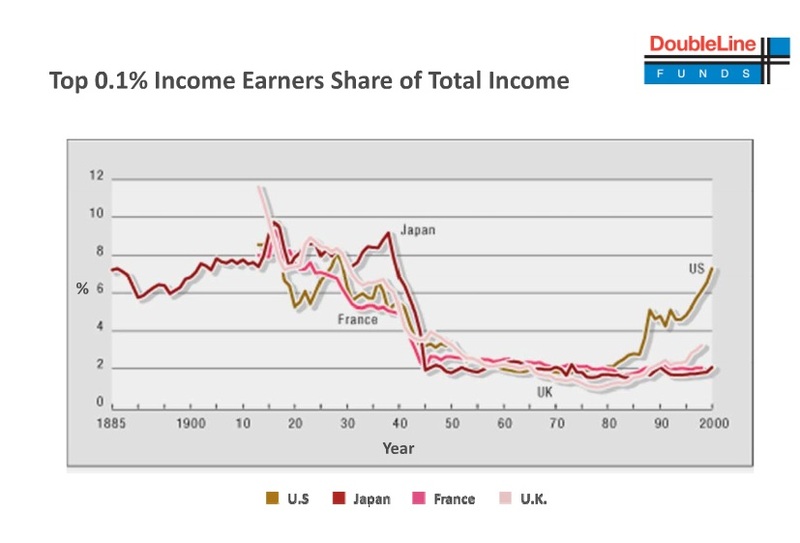 Long term, these attitudes inhibit economic dynamism (what would America be without the American Dream of social mobility?) and social tensions. While many college kids work internships this summer, the sons and daughters from 20 of the world's richest families will head to New York to learn how to wield their money and power—the right way. The $25,000, six-week program launching in June is designed to give the next generation of wealth clues to running a business and giving to charity. Participants will also take trips to "the most exquisite weekend get-a-ways," including the Hamptons, Cape Cod and the Berkshires, according to the program's brochure. Down that road lies class warfare and could ultimately turn America into Argentina. In a rare early morning weekend vote, the House approved an aggressive plan Saturday to eliminate dozens of federal programs and offices while slashing agency budgets by as much as 40 percent, drawing out more than $60 billion in deficit savings. Wow, $60 billion! How dramatic is that? Republicans like to focus on the first two items and regard the last two as sacrosanct. The Democrats, frankly, don't have any great ideas. Personally, I believe that everything should be on the table. It's a question of how Americans want to pay the piper. The long-term rise in medical spending is a total reflection of falling or flat productivity in the healthcare sector. If we can fix that–through a combination of techological advances and institutional change–we can in effect grow our way out of the entitlement problem. There is always defense spending. Many analysts have pointed out that it makes no sense for the US to be spending roughly 50% of the global military budget. Who is threatening them? Aliens from Mars? 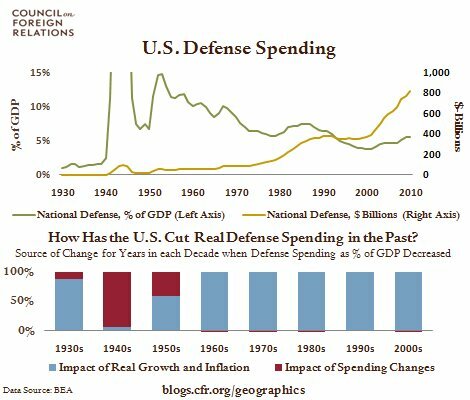 On the other hand, the Center for Geoeconomic Studies pointed out that defense spending as a percentage of GDP is already relatively low. Given how defense interest are entrenched in Washington, how realistic is the prospect of deep cuts? Then there is always the default option. The US government can either explicitly default (interest on debt) or implicitly default (altering the terms of Social Security). Each has its costs and nasty consequences. It's a question of how you want to pay the piper. This is the story of how an over-extended empire sought to cope with an external debt crisis by selling off revenue streams to foreign investors. The empire that suffered these setbacks in the 1870s was the Ottoman empire. Today it is the US. In the aftermath of the Crimean war, both the sultan in Constantinople and his Egyptian vassal, the khedive, had begun to accumulate huge domestic and foreign debts. Between 1855 and 1875, the Ottoman debt increased by a factor of 28. As a percentage of expenditure, interest payments and amortisation rose from 15 per cent in 1860 to 50 per cent in 1875. The Egyptian case was similar: between 1862 and 1876, the total public debt rose from E£3.3m to E£76m. The 1876 budget showed debt charges accounting for more than half of all expenditure. The loans had been made for both military and economic reasons: to support the Ottoman military position during and after the Crimean war and to finance railway and canal construction, including the building of the Suez canal, which had opened in 1869. But a dangerously high proportion of the proceeds had been squandered on conspicuous consumption, symbolised by Sultan Abdul Mejid's luxurious Dolmabahçe palace and the spectacular world premiere of Aïda at the Cairo Opera House in 1871. In the wake of the financial crisis that struck the European and American stock markets in 1873, a Middle Eastern debt crisis was inevit able. In October 1875 the Ottoman government declared bankruptcy. The crisis had two distinct financial consequences: the sale of the khedive's shares in the Suez canal to the British government (for £4m, famously ad­vanced to Disraeli by the Rothschilds) and the hypothecation of certain Ottoman tax revenues for debt service under the auspices of an international Administration of the Ottoman Public Debt, on which European bondholders were represented. The critical point is that the debt crisis necessitated the sale or transfer of Middle Eastern revenue streams to Eur­opeans. If Americans truly want to cut the budget deficit by cutting spending, then they will have to make some real sacrifices (or raise taxes). Otherwise this is how empires decline. It is instructive to see how the markets react in the face of good or bad news. Fundamentally, there is every reason to be bearish. The latest BoA/Merrill Lynch Fund Manager Survey shows extreme levels of bullishness, which is contrarian bearish. I awoke this morning to see that China had hike reserve requirements again by 50bp. The Shanghai Composite was down 0.9% but Hang Seng was up 1.3%. Europe is mixed. As I write this, ES futures are actually up marginally. Momentum remains positive and it's overpowering the bad news. The old me would have been very bearish here but now that I have embraced the Dark Side I am still giving the bulls the benefit of the doubt. The trend is your friend, until it isn't. I have always regarded stock exchanges as bastions of capitalism. In the wake of the proposed mergers of Deutsche Boerse and NYSE-Euronext and the LSE and the TMX, it was interesting to see the reaction in some quarters. As for the former transaction, concerns have been raised because Deutsche Boerse shareholders will control 60% of the new entity. Moreover, 10 of the 17 board seats will be held by Deutsche Boerse directors and the remainder by NYSE-Euronext directors. Never mind that the point of the transaction is to merge trading platforms, with a focus on derivative markets - which to me makes lots of sense. I happened to discuss the LSE/TMX merger with a number of investment professionals last week and my opinion was also positive. Viewed in a global context, the Canadian market is tiny and would benefit from a focus on comparative advantage and Michael Porter's ideas about industry clustering, specifically the financing of resource extraction companies. Canadians know mining and energy companies and have been financing them for generations. I have been acquainted with investment bankers whose advice to resource companies to list in Canada, regardless of where the resource or reserves are, because small and mid-cap Canadian listed resource extraction companies tend to trade a higher multiples than similar companies listed elsewhere. A TMX tie-up with the LSE would expand the horizon for Canada as the place to go to for resource financings. Alas, it seems that nationalism has gotten into the act, just like the case of the Deutsche Borerse/NYSE-Euronext merger. At the federal level, Industry Minister Tony Clement made noises that he will review the proposed transaction to ensure that it is of "net benefit" to Canada. That's because much of the regulatory authority exists at the provincial level, where the merger can be blocked, and Ontario Finance Minister Dwight Duncan has already called the stock exchange a "strategic asset" and objected to the fact that the largest shareholder of the merged entity would be Dubai, with a 11.3% interest. Some Bay Street lawyers are echoing concerns voiced by the Ontario government over the proposed merger between the Toronto and London stock exchanges, saying it could lead to the loss of high-paying jobs in Canada’s financial capital. Lawyers involved in helping companies list their shares for trading are concerned about potential job losses in Toronto, a major financial hub that employs more than 300,000. It is sad that even in the bastions of capitalism, high minded ideals about free markets have given away to nationalism and protectionist sentiments. Do the Chinese care much about love? My post about Amy Chua's Tiger Mother book drew a lot of reaction, mostly the book was a criticism of individual parenting styles. This got me to thinking. What does this obsessiveness about our kids' success imply about the competitiveness of different societies? James Altucher also drew a firestorm of criticism when he wrote 10 more reasons why parents shouldn't send their kids to college. He argued that college is expensive and a waste of time. Kids spend all their time partying and doing very little learning. Instead, he suggests that kids become entrepreurs by starting a business, or pursue their dreams, by either learning and perfecting a cherished skill. etc. These kinds of solutions only work well for exceptional people. While we would all like to think that our kids are exceptional, mostly they are in reality average - by definition. For this group, Mike Mandel puts the reality of young college graduate unemployment into context. The debate over whether to be industrious (Tiger Mother parenting) and to pursue your own dreams (as per Altucher) is a debate over the value of an education. Philip Delves-Broughton, writing in The Economist, has questioned the value of an MBA. There is no question that education is expensive but it's still worthwhile. As the first chart shows, the rate of improvement in unemployment for the less educated is better than the educated in the 2010/2009 period. 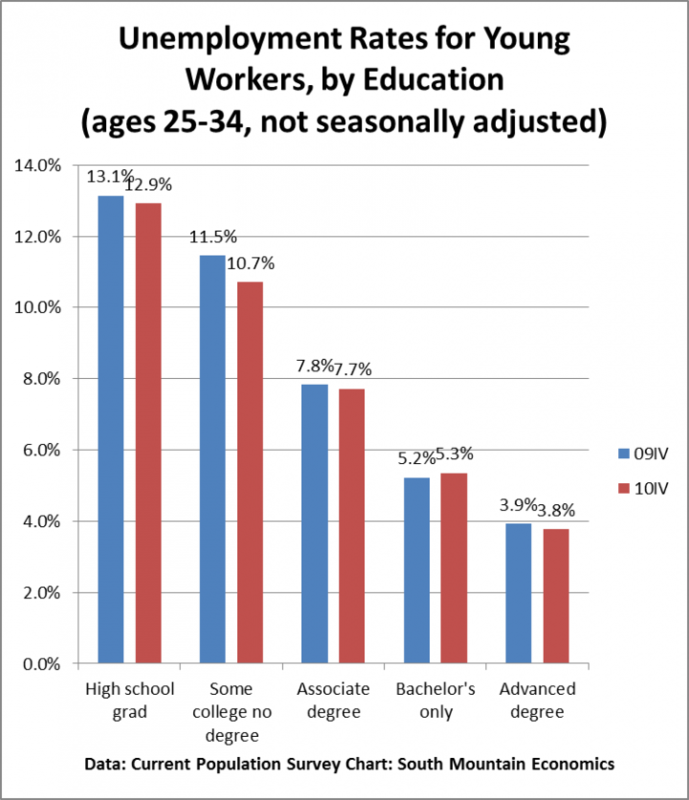 On the other hand, the absolute level of unemployment for the more educated is a lot lower than less educated and the results slope downwards monotonically. And so the debate rages on. Consensus seems to indicate that a top MBA programme does matter is you are intending to launch into a management consulting or investment banking career, where the competition for MBA's is most heated. To be frank, the main reason to go to a top ranked school isn't necessarily the strength of the curriculum. Funny that. While I'm sure that the top 10 programs are arguably tougher than say the 50 - 60 ranked programs, I'd venture to say not by a whole lot. So what's all the fuss? The true value is brand name and connections. The social and business networks you gain from these top schools are easily worth the tuition. After two years of shared project angst and coffee-filled all-nighters, it's often easy to reconnect with good friends or even acquaintances from your MBA days with a simple email or phone call. The bond created through an alumnus is a strange, mystical thing, especially at top tier schools where the sense of belonging to an elite group is strong. Employers these days do give more weight to your experience than to your degree, but they're still more likely to favour people they know. Sorry, folks. The Harvard MBA network is a very impressive example of how productive a branded network can be for graduates. Come resume screening time, it proves to be a huge leg up if the recruiter recognises you as an alumnus. Employers assume, with some justification, that someone who managed to get into an elite school (and pay the tuition, to boot) is ambitious, intelligent, and motivated. Further to this, many of your old buddies would probably be at senior positions in major companies 10-15 years post graduation. Now, you are both in the situation to "scratch my back, and I'll scratch yours." We can also extend those conclusions to an undergraduate education. It's not just about what you what you learned, but the branding, i.e. you have a piece of paper showing your credentials. Today, most of the industrialized countries recognize the value of university education. Higher and higher proportions of the population are being pushed into universities compared to 50 or 100 years ago. As a consequence, a global educational arms race has developed. We have seen that in the attitudes of Amy Chua and others. Moreover, we have seen the results in the Olympics like competition (if you aren't in the top three and a medalist you don't count) in MBA education. Then there are the rest. One of his biggest challenges as a teacher is that they don't know much. He teaches social history, and he can't assume they know what “tenements” were, or “steam locomotives.” They're digital whizzes, but they can't do the mental math of “10 per cent off.” Despite 12 years of schooling, they arrive at university with a poor stock of general knowledge. On the other hand, attitudes towards education have been getting downgraded in the last 50 years. Consider the level of respect that the teaching profession is getting in America (you're a fool to be a teacher, teachers are lazy civil servants, etc.) compare to China (a highly respected profession); science fair participating is falling; and the message about priorities when a Texas high school spends $60 million on a football stadium in the current climate of austerity. 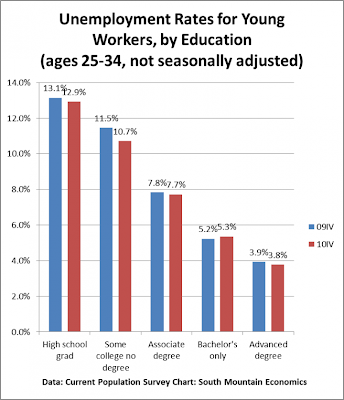 When it comes to competitiveness, education still matters. While western societies now turn their attention to concepts such as child-centered education and self actualization, other countries are catching up in other measures and the American lead is getting eroded. On the other hand, it is also important for personal self-fulfillment to be happy at what you do. Speaking personally, I have been lucky to have been able to pursue both my passion and be fortunate enough to be in a business that pays well. I would not be writing this blog if I wasn't passionate about investments and markets. I would not have re-entered the business after trying semi-retirement by starting a new fund if I did not believe that I was offering a real solution to the current environment of a volatile and low-return investment environment. * Before the flame wars begin, that was a rhetorical question. Of course the Chinese think about love. Barry Ritholz wrote last week that he was watching the Hang Seng Index closely for signs that risk aversion is rising. Should the index violate support at 22,600, then it would be a sign to get more defensive in their portfolios. Like Barry, I do watch the Hong Kong market as an important "tell" to China and the Chinese economy. But there are other important indicators for China and for investor risk aversion. For instance, while the Hang Seng Index has been taking a tumble after their markets returned to work after the Lunar New Year, the Shanghai Composite has rallied in the same timeframe. Commodity prices, which are canaries in the coal mine of global growth and inflationary expectations, remain in an uptrend. Other measures of risk aversion, such as the ratio of US Consumer Discretionary stocks (XLY) to Consumer Staples (XLP) is looking bullish. The ratio of the Morgan Stanley Cyclical Index to the market, another indicator of growth expectations, is testing a level of relative resistance but remains in a relative uptrend. If the Hang Seng were to break down, it is not necessarily a Sign of the Apocalypse but perhaps an indication of a minor pullback. Until we get a bearish consensus on these other indicators of investor risk aversion, I would be inclined to give the bulls the benefit of the doubt in the intermediate term. Yet inflation anxiety is rising. There seems to be a disconnect between what the Fed is saying and what people are experiencing when they fill up their gas tanks or read about rising food prices around the world. Over the last couple of weeks I've taken note of newspaper headlines. Here's a sampling: In USA Today, "Prices starting to creep higher"; in the Wall Street Journal, "Cost inflation puts a wrench into the works" and "Inflation fears replace other market worries"; in Fortune magazine, "How inflation is turning breakfast into a luxury item"; and just last Friday in the Journal, "Bernanke denies that Fed is stoking inflation." Are the Fed and the public on different planets? I have always maintained that inflation is likely to show up as hard asset inflation, i.e. commodities, than in a rise in generalized price levels, as measured by CPI - which is watched closely by central bankers and the bond market. This dichotomy has the potential to create real distortions. The Fed governors worry (like any sensible people) about the CPI flirting with deflation. Falling prices drives asset prices down. Worse, they drive down wages — while people’s debts remain fixed. That vise crushes the middle class (the poor don’t have debts; the rich have real asset wealth). But the Fed’s printing presses can prevent deflation (or at least severe deflation, if not necessarily Japan-style deflation-lite). But the opposite condition is equally bad — and also looking more likely. Wages rising slower than prices. 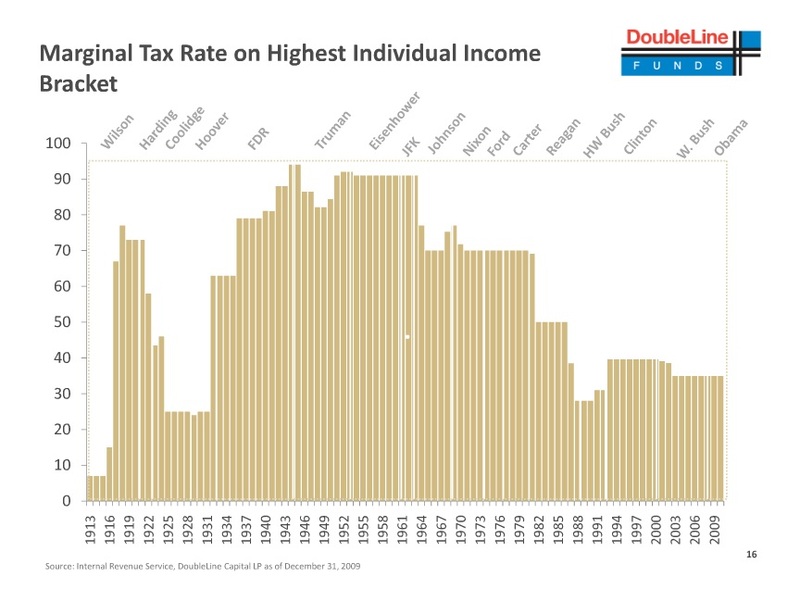 That’s death for the debt-heavy US middle class. The US is flirting with this today. Central bankers believe that the inflation cycle is broken if wage inflation is contained. That just means that inflationary pain is borne disproportionately by the suppliers of labor compared to the suppliers of capital. I have written extensively about the risks of widening the social divide. Should this continue, the best case is that America goes down the Argentinean road; the worst case can be found in places like Tunisia and Egypt. Is your investment policy ready for market trauma? 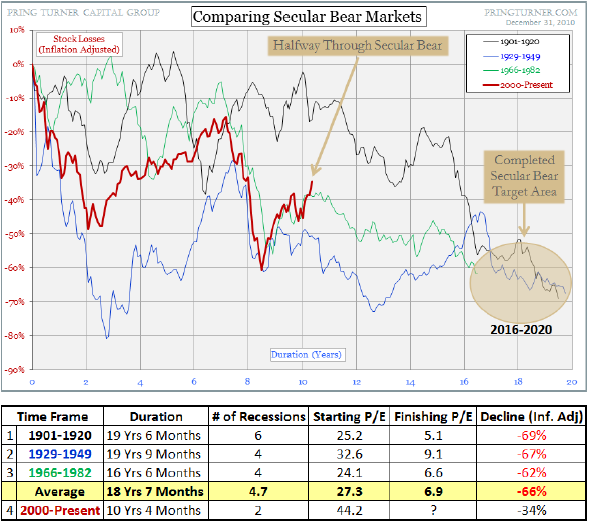 Cullen Roche at Pragmatic Capitalism posted a chart from Pring Turner Capital comparing the current stock market to previous secular bear markets in the past. They go on to state that the current secular bear could last until the 2016-2020 timeframe. I wrote about this back in July 2010 (see Wait 8 years for a new bull?) and pointed to a study by John Geanakoplos et al as they related demography to long-term stock returns, with the conclusion that a new secular bull is likely to begin 2018. Everyone should be made aware of the insanity of it all, and that preserving their capital and growing it slowly and prudently is a totally appropriate strategy for this radical money easing environment. This type of policy breeds speculative and dubious rallies, but what they inevitably trigger are boom-bust cycles such as the ones we saw in 1999-2002, 2006-2009, and the current one we are in today. This is no time for short memories. The Fed has created an "inflation" mentality in commodities, foodstuffs and stocks ― aided and abetted from a U.S. dollar that has sunk back to two-month lows. At the same time there is still a "deflation" mentality for many final consumer goods, which is unlikely to change until the employment picture improves further. Stay liquid and keep your powder dry for investment opportunities. Capital preservation is going to a key consideration in such a volatile environment. Be more tactical and use models such as my Inflation-Deflation Timer Model to preserve capital and benefit from any intermediate term volatility. Be aware of the risks in allocating funds to value oriented strategies (e.g. high quality stocks, as per Jeremy Grantham) or income oriented strategies (e.g. high dividend yield or SIRP as per David Rosenberg). While such buy-and-hold approaches are likely to outperform the market over the longer term, investors will have to be prepared to withstand periods of high drawdowns, i.e. losses, such as the episodes seen during the Lehman Crisis of 2008. Today, we have the cross-currents between a powerful Fed injecting liquidity into the markets (see my post on Bernanke preparing the grounds for QE3) and an overvalued equity market. Comstock Partners believe that the current stock market looks like 2000 and 2007. I would agree that current conditions feel like late 2007 and early 2008. We have commodity prices on a tear, which is bullish, but evidence of systemic failures (subprime and CDS/CDOs then, Europe and the muni market now), which is bearish. Such situations do not resolve themselves well but the timing of the failure is anyone's guess. Bottom line: get ready for volatility and make sure that you have right investment policy and risk controls in place to deal with market trauma. Q: What's the connection between QE and higher stock prices? Bernanke: Monetary policy also works through asset prices (which are guided by lower interest rates). So yes, there is a connection. 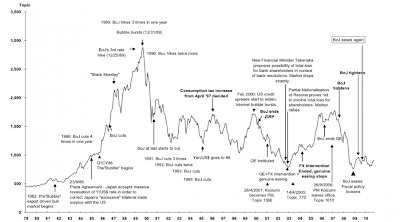 But there's a virtuous circle of asset prices stimulating economic activity, which then also improves the markets. Did he just say that? Is the Fed targeting stock prices?!? Q: Will there be a QE3? Bernanke: In the end, we'll just ask the same questions. Where's the economy going, and what do various inflation indicator look like? We'll ask those questions. If unemployment is still too low, then we may continue. If we're moving towards full employment, then we won't need to stimulate more. While indicators of spending and production have, on balance, been encouraging, the job market has improved only slowly. Following the loss of about 8-1/2 million jobs in 2008 and 2009, private-sector employment showed gains in 2010. However, these gains were barely sufficient to accommodate the inflow of recent graduates and other new entrants to the labor force and, therefore, not enough to significantly reduce the overall unemployment rate. Recent data do provide some grounds for optimism on the employment front; for example, initial claims for unemployment insurance have generally been trending down, and indicators of job openings and firms' hiring plans have improved. Even so, with output growth likely to be moderate for awhile and with employers reportedly still reluctant to add to their payrolls, it will be several years before the unemployment rate has returned to a more normal level. Until we see a sustained period of stronger job creation, we cannot consider the recovery to be truly established. There you have it. Bernanke answered his own question. Inflation remains quite low and job creation is weak. In other words, get ready for QE3. On the other hand, John Taylor wrote in December 2010 that the markets were signaling tightening in 2H 2011. Who is right? While Americans and American investors will be keeping a close eye out for the Non-Farm Payroll release this Friday and the Super Bowl this weekend, I'll be watching commodity prices in the next couple of weeks for a clue on the intermediate term trend of the market. Commodity prices are important as they are the canaries in the coal mine of global growth. China has been the marginal buyer of commodities in the current environment, but the Chinese authorities have taken a variety of steps to try to slow their overheating economy. As the Year of the Rabbit dawns on February 3, sources tell me that many Chinese state owned enterprises have virtually shut down ahead of the new year due to the fact that they have spent their budget for the year. We should therefore be watching commodity prices closely as a quick-and-dirty barometer how Chinese growth might pick up once the new year begins. Despite all of the hand wringing over China's administrative measures to slow their economy, commodity prices, as represented by the CRB Index below, remain in a well-defined uptrend. Moreover, they staged an upside breakout this week. Watch this space! It's going to be a lot more important than indicators like the very noisy NFP release Friday. I spend a lot of time thinking about risks to my models and forecasts. In my readings, one of the risks that doesn't seem to get mentioned very much is the instability from high frequency trading (HFT) algorithms. For the newbies, see this video for a primer on HFT. Long ago, before trading algos dominated stock exchange volume, trading was a relatively simple matter. Buyers and sellers met on the stock exchange floor in a price discovery process. Eventually trades got done and prices reflected the supply and demand dynamics of real buyers and sellers. Brokers acted as agents and got paid a commission for acting as an agent. The problem of asymmetrical information is compounded by the confusion between the roles of agent and counterparty. I grew up in a world where stocks and other financial instruments were traded by the client with a high degree of trust in the agent. Millions of dollars traded on a word, without a tape recording. Somewhere along the way, without any formal announcement of the change, the “client” in a trade mutated into a “counterparty” who could be exploited. Steadily along the way, the agents’ behavior became more concerned with the return on their own trading capital than with the well-being of their clients. One of my nastiest shocks in 45 years was the realization one day in 1985 that we had been ripped off by our then favorite broker on one of the early program trades we were doing. We had supposed we had developed a trusting relationship. We had certainly done many incentive trades that were successful from our point of view. Perhaps, with hindsight, our strong incentives might have merely motivated them to rip off some other client. Brokers stopped viewing clients as clients and began to view them as trading adversaries. Somewhere along the way, the quants took over and market making became more automated. Today we have a proliferation of HFT algorithms on the virtual floor of the exchange. But what happens when a good idea becomes widely adopted and becomes the market? That's what seems to be happening with HFT algos trading the market. Paul Wilmott wrote that his inbox is now stuffed with announcements about HFT and HFT conference - which is an ominous sign. With HFT, it's an arms race. You need to be faster and have more information than the next guy. As part of that evolution, we have algos that adjust order flow for latency and we even have a hedge fund that scrapes data from Twitter to trade the market as part of that evolution. Here is my nagging worry: What happens if too many HFT algos start to dive on the same information source? Would that create an informational and price cascade? We know how quickly computers can generate orders, were similarly (momentum) oriented algos tried to trade on the same data and started to stampede, how long would it move the market before intelligent adults stepped in to shut the whole thing down? There’s a growing understanding and belief on Wall St, especially intraday, that there’s a strong game-theoretic aspect to the market: the performance of a given strategy depends on what other strategies are trading in the market at the same time. My payoff is a function of what I do and what the other players in the game do. The concepts of strategic interaction are important. Game theory is hard to understand even in simple cases. And now strategies are adaptive, so it’s especially difficult. I’m not frightened by it, but it’s a legitimate concern. People who build good machine learning algos have a fair amount of knowledge about what they’re doing, but they’re still adaptive. It’s natural to have the model retrain itself each night based on each day’s data. Humans might not know what incremental modifications today’s data introduced in this adaptive process. If everybody’s doing this, you can easily imagine various effects. That could be a bad thing from a stability standpoint in the markets. Our financial markets have become a largely automated adaptive dynamical system, with feedback. Furthermore, a dynamical adaptive system with feedback is challenging ordinarily, but this one is also strategic. A flight controller is dynamical, but not strategic. Add an adversarial environment, and there’s no science I’m aware of that’s up to the task of understanding the potential implications of that system. In addition, we know that hackers can introduce latency into HFT systems, which cause instability. What happens in a fast moving market? Is the instability "stable" or would it create wild price oscillations? Before anyone flames me to tell me how implausible such a scenario is, recall how dynamic delta-hedging/portfolio insurance strategies contributed to the downside volatility in the Crash of 1987.